While taxpayers feel they have been hit hard by the budget presented by the ministry of finance, Business Eswatini has commended Minister Neal Rijkenberg for, amongst other things, VAT on electricity and freezing the Cost of Living Adjustment (CoLA for civil servant. Making his remarks during the post budget seminar hosted by the Central Bank of Eswatini at the Royal Swazi, Ezulwini yesterday, Business eswatini President also Montigny Group CEO Andrew le Roux, who spoke on behalf of the private sector, commended the spreading of the tax burden to include the shadow economy, which will be made possible by the introduction of the consumption tax, the ease of doing business index, as well as the reduction of the regulation and labour law reform and also the tax appeal tribunal and tax reform. 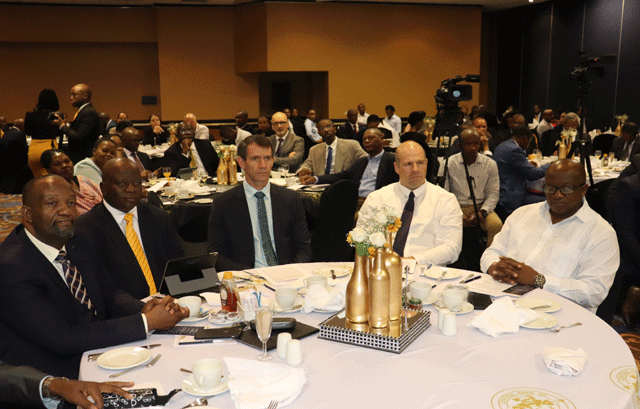 The CEO said they had learnt from the budget speech presented by the minister that there was a realisation of the economic crisis and a firm grasp on the economic realities at hand that there is need for fiscal consolidation and the need to do things differently. He stated that this recovery could only be a private sector-led recovery and that government needed to get smaller to allow for the fiscal space that the private sector needs to grow. “We have seen that there is a strategy; the first and most important step of which is to restore confidence with our lenders, our private sector and with our financial institutions. With the fully-funded budget being the first step, I believe that this has been achieved,” he said. He, however, noted that the budget was still lacking in that it is long on some promises and short on specifics. He cited the Corruption Perception Index as one of those promises by government. “Every person in this room knows of a story involving corruption. Yet, nobody has gone to jail and we are not allocating the resources to this scourge to show that we are serious about it. “There is more corruption, and more people think it is ok to be corrupt. Justice needs to be seen to be done. “On the issue of CoLA, while it may be fiscally prudent to freeze cost-of-living adjustments, this will not solve the problem. We do not believe that Eswatini is going to be able to ‘trade its way’ out of this.The budget refers to Civil Service commitments of about E8 billion per annum, but once allowances, pensions, public enterprises and the like are included, this amount balloons to E 11.5 billion, or about 2/3 of our total revenue. This is simply not sustainable, and increased taxes are not going to fix this,” he said. The CEO highlighted on the issue of reduced corporate tax that business looks for certainty, hence the need to know what the significant tax reductions are in order to best allocate their capital and resources. He added that tax reforms alone were not enough to attract investors. “Attracting FDI and growing the economy: At this forum 12 months ago, we commended government for passing the SEZ Bill. A year later, how many investors do we have? 10? 5? 0? We have a raft of policy decisions and adjustments to make before Eswatini becomes the investment destination of choice in the region. “As Emaswati, we know that Eswatini is a great place to do business (eg Montigny), but every indication is that for a foreign business, for fresh money and investment, we are closed for business. Our regulatory environment has reached the realms of the ridiculous, our processes for starting and running businesses, or even just opening a bank account has not improved: what takes two hours in Mauritius takes 30 days in Swaziland,” he said. As a result, the taxpayer,investor and the consumer continue to pay for this, through stealth taxes, a lack of regionally competitive investment packages and incentives, and a lack of service delivery. I have the privilege of engaging with multiple development partners and agencies - I can give this audience the assurance that there is faith in this team, confidence in this budget and optimism for the future. And we look forward to the specifics,” said.